The death of brain cells in Alzheimer's is currently unstoppable. Solanezumab may be able to keep them alive. Current medication, such as Aricept, can manage only the symptoms of dementia by helping the dying brain cells function. But solanezumab attacks the deformed proteins, called amyloid, that build up in the brain during Alzheimer's. But when Eli Lilly looked more closely at the data, there were hints it could be working for patients in the earliest stages of the disease. So the company asked just over 1,000 of the patients in the original trial with mild Alzheimer's to take the drug for another two years. And positive results from this extension of the original trial have now been presented at the Alzheimer's Association International Conference. Dr Eric Siemers, from the Lilly Research Laboratories, in Indiana, told the BBC: "It's another piece of evidence that solanezumab does have an effect on the underlying disease pathology. "We think there is a chance that solanezumab will be the first disease-modifying medication to be available." The company also started a completely separate trial in mild patients in 2012, and these results could prove to be the definitive moment for the drug. Today is not the day to jump up and down proclaiming a breakthrough in slowing the pace of Alzheimer's. The limited data which has been released is the scientific equivalent of a poll before a general election or a trailer ahead of a movie. It provides captivating clues, hints and teases, but nothing definitive. 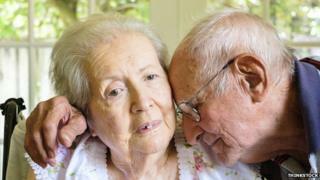 At the moment there is no medication that can slow down dementia. If such a drug was developed it could transform how the disease is managed. People would still get worse, but they would spend more time in the milder phase of the degenerative disease rather than needing constant care. In a field that has been plagued by repeated disappointment, even a hint of such a drug is an exciting moment. Next year, when further trial results are due, we will know for certain whether solanezumab is the breakthrough everyone hopes it could be. Dr Eric Karran, the director of research at Alzheimer's Research UK, told the BBC News website: "If this gets replicated, then I think this is a real breakthrough in Alzheimer's research. "Then, for the first time, the medical community can say we can slow Alzheimer's, which is an incredible step forward. "These data need replicating, this is not proof, but what you can say is it is entirely consistent with a disease-modifying effect. "We've never ever had evidence that we can affect the disease process." Clare Walton, the research manager at the Alzheimer's Society, told the BBC: "The data hints that the antibodies are having an effect, it is promising and it's better than no effect, but it's inconclusive. "After a decade of no treatments and many drug failures, it's exciting to get promising news, but it doesn't really tell us either way, and we need to wait for the phase-three study, and that is in 18 months." In the first stage of the original trial, which ended in failure, half of the patients with Alzheimer's were given solanezumab and half were not. A reanalysis of the cognition scores of the patients with mild Alzheimer's suggested taking the drug had cut the rate of the disease's progression by about 34%. In the extension of the original trial, all of the 1,000-plus mild Alzheimer's patients participating were given solanezumab. So, at the end of the extension, half of them had been taking the drug for three and a half years while the other half had been taking it for two years. If the patients' brains had continued to decline at the normal pace and the drug had been merely helping with symptoms, then all of the patients participating in the extension of the original trial - whether they had been taking solanezumab for three and a half or two years - would have had similar scores of cognitive function.